10 Mirrors just £350 incl Free Delivery to UK mainland (excl Highlands) - call or email to order. Why Stabled horses benefit greatly from Stable Mirrors. Every horse which spends any significant time in a stable is alone and away from its natural herd. It faces psychological challenges from boredom and lack of company. This results in 15% of stabled horses exhibiting stable vices such as box walking, weaving, crib biting etc. That is roughly 1 in every 6 stabled horses. From studies we are actively involved in (on an ongoing basis) it is becoming apparent that around 50% or more of stabled horses show identifiable signs of discomfort and unhappiness at the lack of company whilst stabled. Further research we are embarking on will be exploring the effect on the performance of horses involved in competition with and without mirrors. In both Scientific studies and use in stables installing a Stable Mirror has produced astounding results with horses becoming more relaxed, happier and with a very significant effect on reducing or stopping stable vices. 50% + of horses are measurably more content and happier with a stable mirror than they were before, as found In studies we have sponsored. Weaning foals and young stock with a mirror in the stable becomes a calm and painless process as many of our customers have found. Night-time Sleep - Horses with Mirrors will lay down and sleep in their box as they feel a 'herd companion' is standing guard over them. First noted by the Veteran Horse Society, many of our customers have found the same. We will shortly be undertaking a research study into this to see if there are measurable differences in performance and feeding requirements as a result. Ulcers and Gastric Complaints. Horses which have developed severe gastric ulcers as a result of neurosis and stress in the stable have recovered when a mirror was fitted. We first came across this when a customer called us and said that after a leading professor of veterinary medicine had exhausted all possible remedies and her horse was facing being put down within days she had installed a mirror as a last ditch attempt. Within 3 days her horse had turned the corner and now has fully recovered. Since then there have been a number of similar results. Vets treating horses with a similar problem are invited to take part in a study and we will supply mirrors as part of the study - please call or email us as this may be a significant addition to the treatment available. Aries, above had been a constant weaver, box walker and crib biter for more than 12 years following 9 months on box rest as a 2 year old. His behaviour worsened following the death, in late 2005, of his dam who he been with all his life. His case came up during a study we were involved with, although he was not part of the study. We decided he needed to be included and, after 2 weeks monitoring to record and film existing behaviour, we installed a large stable mirror for him. Within 1 minute of him being introduced to his new Stable Mirror he was 'making friends' with it, and from then forwards he was completely relaxed. He no longer weaved or box walked and his previously incessant crib biting was reduced to an occasional bite on the box door when eating his feed. The way in which he stopped weaving and box walking immediately is a very typical reaction , as is the significant reduction in crib biting. We will shortly be adding some short video clips showing Aries and other horses before and after the installation of their mirrors. VETS - ARE YOU TREATING A HORSE WITH GASTRIC PROBLEMS / ULCERS - which is very nervous and neurotic in the stable? If so and given the dramatic improvement and recovery experienced by horses belonging to some of our customers with horses on the point of being put down we are very keen to carry out proper studies into this. Please contact us by email or phone. email by clicking here or call on 01344 8860860. If you are an owner of a horse suffering as above and would like your vet to try this as a possible cure then please contact us to take part in the trial. Herd Animals - removed from their herd. Horses, as we all know, are herd animals and spending any length of time in a stable places them in a highly abnormal situation where they are separated from the direct companionship of other horses. This leads to stress and boredom and, as a direct result, many horses react badly or feel insecure developing stable vices such as weaving, crib biting, box walking, and windsucking. A stable mirror provides permanent 'companionship' leading to a relaxed and happier horse and removing the stress which causes stable vices. We can't always choose how long our horse is stabled for. We can't always help or change the amount of time our horse spends stabled be it through its work and training regime or simply the restrictions of the facilities available to us. But we can help overcome the loneliness and try and improve the quality of that time by installing a stable mirror. Mirrors need to be unbreakable for safety. We only sell Acrylic Stable Mirrors, these are recommended by scientists for safety. In the Section Boredom and Stable Vices you will find a selection of articles which appeared online in the Daily Telegraph, BBC, NFU and other web sites as well as Scientific Research and papers on Stable Vices, Boredom in stabled horses and the use of Stable Mirrors. The Stable Mirror Company is based in Windsor, Berkshire and ships all over the UK, Europe and to North America (USA & Canada) via insured courier. 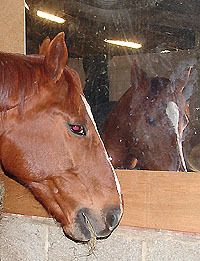 Mirror sizes range from 3 sizes of Stable Mirrors for Ponies, medium Horses and large Horses. We also supply 8ft by 4 ft (2.4m x 1.2m) mirrors for Indoor Arena, Menage or School use. We prefer to call them Stable Mirrors although some people have referred to them as Horse Mirrors. Whatever you call the mirrors one thing is certain, by fitting one for your horse or pony you will improve its quality of life when stabled. Buy or Order securely online, by mail or on the phone. If you have a saddler you would like to supply you then we are happy to arrange this with them. Please see Terms and Conditions there. 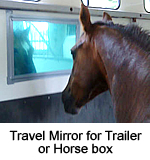 See more below about how Horses, ponies and their owners can benefit from using Travel mirrors. We have a number of research programmes we are preparing or looking to undertake and researchers and Final Year Degree Students are welcome to be involved. Email us or call.